East Greenwich Town Hall is located at 125 Main Street, East Greenwich, RI 02818; phone: 401-886-8665. Photo: Windmill Cottage, ca. 1790, 144 Division Street, East Greenwich, RI. Listed on the National Register of Historic Places in 1973. Photographed by User:Swampyank (own work), 2008, [cc-by-3.0 (creativecommons.org/licenses/by/3.0)], via Wikimedia Commons, accessed May, 2014. 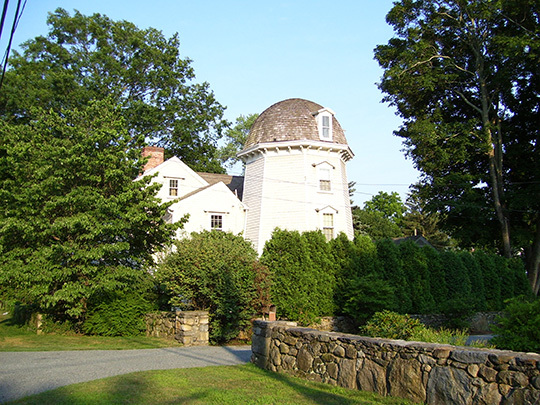 East Greenwich is a village that is the center of the township of the same name. The village is built on the side of a long hill facing Greenwich Bay. The Potowomut River, lying almost wholly within East Greenwich, flows into Narragansett Bay just south of the mouth of Greenwich Bay. East Greenwich was incorporated in 1677; it became Bedford in 1686, but resumed its original name three years later. It was part of Providence County until Kent County was formed in 1750. Many of the first settlers were veterans of King Philip's War. In pre-Revolutionary days the community produced pottery of a coarse red clay dug from the nearby vicinity of Quidnesset and fired in local kilns. The resulting product was of inferior grade, but pride in local industry gave it preference over English pottery. Calico printing from wooden blocks began in 1790 at East Greenwich, in the Mathewson and Mowry factory.